Fish identification is important in helping biologists identify new subspecies in high lakes. 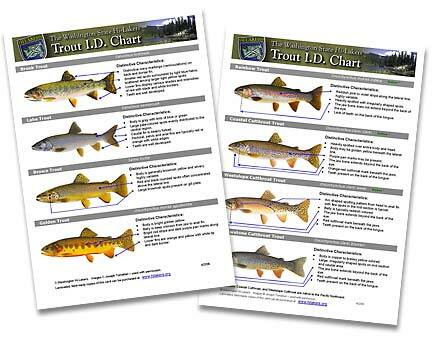 The pocket-sized Trout ID Chart helps in this effort by offering the high lakes fisherman a better understanding of the fish species they catch. The chart shows eight of the most frequently encountered species of trout in Washington’s high lakes. The beautiful Joseph Tomelleri illustrations represent “typical” specimens found in the high lakes. Although actual fish caught in the wild may differ slightly in appearance, the chart lists Distinctive Characteristics for each fish to help establish positive identification. Order your waterproof, field-ready copy of this chart for a $6.00 donation plus 75 cents shipping and handling. Measuring 4-1/2″ x 6-1/2″, it’s the perfect size to slip into your vest or pack. Allow 1 to 2 weeks for delivery. Charts can be ordered directly by clicking on the PayPal link below. Westslope cutthroat trout. Photo by Roger Werth. Yellowstone cutthroat trout. Photo by Brian Curtis. Rainbow trout. Photo by Eric Junes.